C# Programming presents a solid, easy to read and understand entry level course in C# Programming. 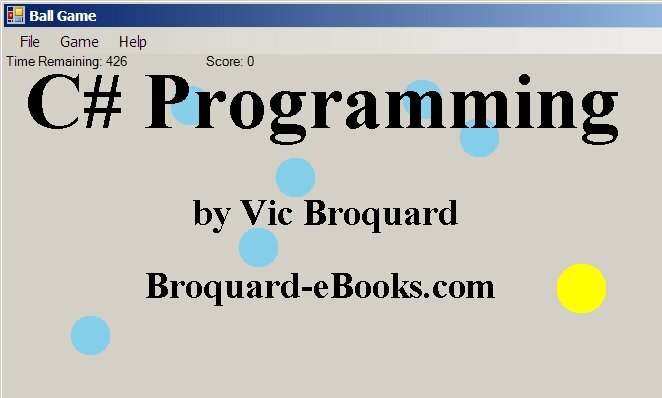 It assumes a familiarity with C++ OOP techniques and covers the basics rapidly. Check out the table of contents to see what’s covered. The ebook is in pdf format and is DRM-free so it can be read on any device that can display pdf files! C# Programming begins with the basic language elements and covers arrays and strings, before moving into a complete coverage of classes and OOP programming. Encapsulation and properties are presented followed by operator overloaded functions. Inheritance, virtual functions, and abstract base classes are covered next. Exception Handling is presented in full. Before tackling forms and the Web interface, the handling of interfaces, delegates and event handling is presented so that the reader can understand what is happening in these more advanced situations. Windows Forms with its event handling is covered in some detail. A game situation is shown which makes use of double buffering for smooth game action. Image processing and database access are covered. Files of various kinds, text, binary, and serialization are discussed along with the many container classes. Next, a database is used in an inquiry situation as well as methods for adding, updating, and deleting records. Web applications are presented next, including many controls as well as database access from a web application. Class libraries and dlls are covered, along with several methods to formally install them on client machines. System Registry operations are presented. Finally, projects to install an application onto a client machine using the Microsoft Installer are covered. C# Programming was in use at Illinois Central College in the Cmpsc 200 C# Programming course and used Microsoft’s Visual Studio .NET 2008 compiler. C# Programming comes in Adobe pdf files. One file contains the entire book. There are also individual chapter pdf files. All of the sample programs are provided as well as the test data needed for some of the programming assignments are provided. If you do not have the Adobe Reader, Get Adobe Reader by clicking this link.